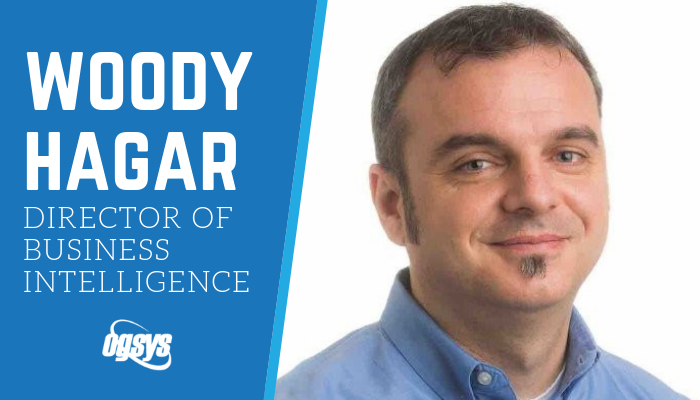 Woody Hagar is our Director of Business Intelligence here at OGsys. Whether it is organizing weekly touch points with each OGsys employee or coalescing the strategic vision of the leadership team, he helps bring clarity and unity within the teams with a true passion for our company culture. Woody has a broad IT background, mainly focusing on data (storage, transmission, organization, reporting and insight). He has spent over half of his career in some sort of leadership capacity, so he is very focused on developing people and growing teams. As an early adopter and practitioner of the SCRUM framework, Woody is both a certified Scrum Master and Product Owner. When asked what he enjoys most about his job, he credits his colleagues. “Most of the employees at OGsys have been here a long time - and they are truly wonderful people. Humble and smart, they really care about the individuals using our products. I really enjoy working with them.” When he is not working, Woody enjoys spending time with his wife and daughters and serving his church, where he plays in the worship band and helps out with the men's ministry. Woody loves visiting the mountains in the summertime, his favorite book is “The Great Divorce” by C.S. Lewis, and if he were a baseball player, his at bat song would be “Spirit of Radio” by Rush. Woody's favorite quote is "I measure success by how many people love me." - Warren Buffett. We certainly love him here at OGsys!